The entries are still coming in for the OUTLANDER 20th Anniversary Contest. Thanks very much to all of you who've sent in your essays already! I'm delighted with the variety of stories I've received so far, and I think Diana will appreciate them very much. I've received a total of 59 entries so far. That's fantastic! Please keep them coming! If you haven't yet sent in your entry, or you've been procrastinating <g>, you have about five days left to think about it. Contest entries must be received by midnight Eastern Time on Thursday, June 30th. 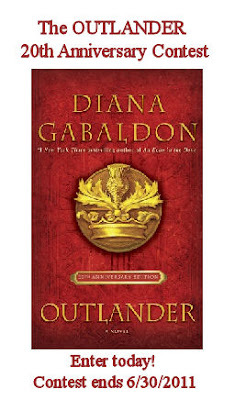 You can post your entry here on my blog (please remember to sign your name, and leave an email address where I can reach you if you win), or email me at Karen.L.Henry@gmail.com with the subject line "OUTLANDER 20th Anniversary Contest". The winner of the contest will be announced here on my blog on Friday, July 1. I hope Diana will be happy to read all these essays from her fans. I hope so too! It's a great collection of stories. For me, that is the best part: Diana getting to hear more from her fans! I have no doubt she hears from fans all day-every day, but this is a meaningful way of letting her know how much her book from 20 years ago (!!!) still touches so many. Well, that was precisely my thought in deciding to do this in the first place. Diana loves to hear from her readers. What better way to help her celebrate this milestone than to share some of our stories with her? I have 60 entries so far. It's going to be a substantial little package -- easily 45 pages or more, when it's all printed out.